Thank you to tonrulkens@Flickr, aka Ton Rulkens, for sharing today’s photograph (via the Botany Photo of the Day Flickr Pool). ‘Tis appreciated. 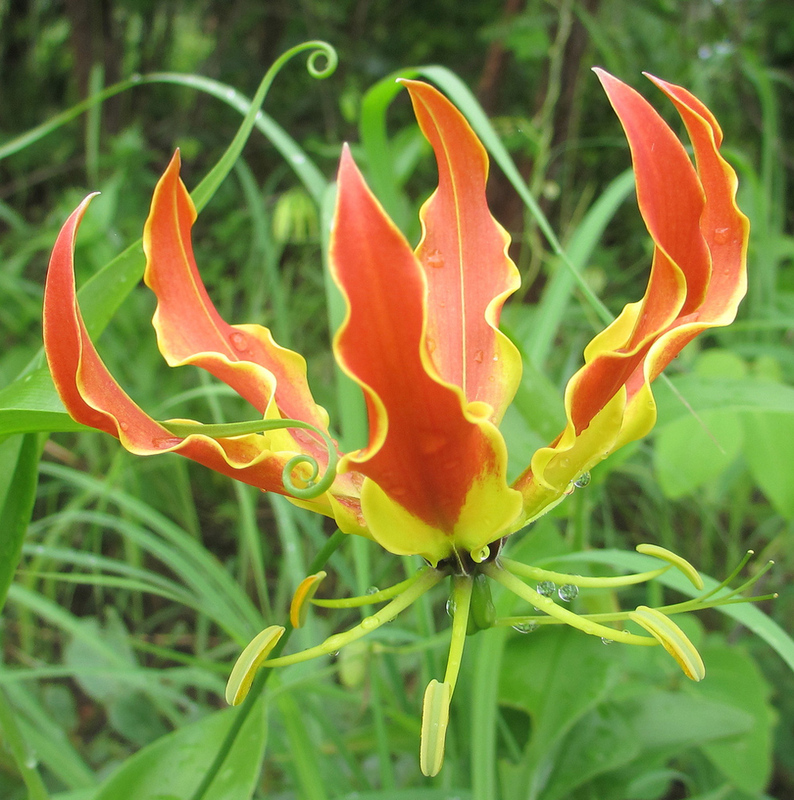 Gloriosa superba, or flame-lily, makes its second appearance on Botany Photo of the Day. A previous image of Gloriosa superba from India suggests that there is little flower morphological variability across its range in the tropical areas of Africa and Asia. Today’s photograph is from Mozambique (Gloriosa superba via Flora of Mozambique). I love the retrospectives you’re giving us, with the comparisons to previous BPOD. Wow! Superb is right! I want one! Fantastic photo. Thank you! What a smart flower to have the pollen outside the colours. I’ve never seen a lily whose leaves have tendril points. Gloriosa superba is the national flower of Zimbabwe (where it is a protected plant) and the state flower of Tamil Nadu state in India. This is also sometimes referred to as the “climbing Lily.” It is scandent. The tendrils will cling to a trellis or support. What a wonderful reminder of the first time, I saw this flower in the wild, in Kenya. I’ve tried to grow this so often … to no avail. I wish I knew its secret. I’ve seen it growing wild – probably as a garden escape – in Rarotonga. It was sort of scrambling across a patch of grassy tanglement, and the local piggies weren’t destroying it. So I had another go when I got home. Still no joy. It’s such a pleasure to see. Try digging up the bulbs when dormancy has arrived, and keep them in a [relatively] warm, dry place until the growing-season has arrived. They like very rick well-drained growing media. I must admit that I have had no success with them since I left the tropics. Lovely photo! I have one of these growing in a large pot in my yard. I am always amazed at how quickly it grows, sometimes 2-3 inches in a day. I live in Hawaii, just about 15 feet above sea level and it seems to really like it here. The plant makes an appearance twice a year, blooms profusely for a few weeks and then dies back until next time. Thank you for all the great photos and interesting info. I always look forward to my BPoD!